ADAS is to offer the driver the current condition of vehicle, driving environment and advance warning of possible danger or accident, which aims to allow the driver to take early measures before the accident occurs. Car sensors include millimeter-wave radar, ultrasonic radar, LiDAR and CCD / CMOS image sensors. Radar has been widely used in ADAS system for mid/high level vehicles and aggressively penetrated into standard level. However, LiDAR has the limitations of product size and cost and hasn’t been widely used. Currently, it is commonly adopted in autonomous car in trial use. Owing to the increase of market demand and technology, LiDAR will enter the market on level 4 and level 5. In addition, LiDAR has advantages in long-distance detection and depth resolution. 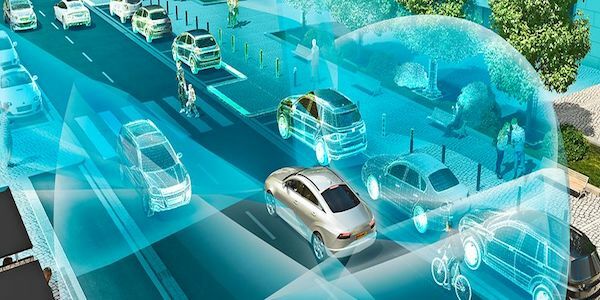 However, LEDinside indicates that there are four main technical challenges for the development of LiDAR in automotive market. In the future, some iamprovements have to be made such as sensing range, angular sensing resolution, field of view and computational challenges. Others include the decrease of product size and cost. In addition, there are challenges during harsh environments such as snow, rain, dust, dirt or collision. With improving technology and brands promotion, LiDAR has been implemented in drones, sweeping robots, and measurement markets. Currently, there are two major LiDAR technologies, including Scanning LiDAR and Flash LiDAR. Scanning LiDAR repetitive pulsed laser and scanner are adopted to achieve 3D LiDAR. While, Flash LiDAR adopts high output single-frequency pulsed laser and time decomposition 2D light receiving array. Flash LiDAR can realize high speed repetitive movement; however, each pulse output of the light source has to be higher than the output of scanning LiDAR. The LiDAR system mostly adopts the pulsed laser light source which is around 905nm. Although the 1550nm LiDAR products are safer for human eye. Presently, the mainstream is Edge Emitting Laser, but VCSEL has the advantages of high speed and optimal pattern design. After the power increases in the future, its development will have high potential. So far, TriLumina has introduced VCSEL array light sources for LiDAR, leading the trend of low cost and high performance for the LiDAR system. Currently, LiDAR Laser Players includes OSRAM Opto Semiconductors, TriLumina, Philips Photonics, and Excelitas.